A remarkable interior product with a soft surface touch, non porous structure and easy to fabricate to almost any shape. From kitchen counters, vanity tops, wall decorations, office desks and interiors, HI-MACS® has your surfacing needs covered. Backed by with a 10-year limited warranty from LG Chem. HI-MACS® is produced on a steel conveyor belt in the form of sheets or as moldings in a modern manufacturing process that meets high safety requirements and conforms to the most exacting quality certification standards. The material is heated in a progressive tempering process (Thermal Cure). It is a two-stages thermal curing process at high temperature. This second stage in the thermal process is what sets HI-MACS® apart from other mineral materials and produces a new and stronger compound in which any structural defects are perfectly evened out. This improved structure automatically affects the quality of the material. Prior to transportation, the front and back surfaces of the sheets are polished in the Cheongju plant in Korea and the Atlanta plant in the USA, providing fabricators with a significant saving in terms of time, particularly when both sides of the sheets are being used. All sheets are also wrapped in a protective film. Developed by the world leader in chemical technology, LG Chem. HI-MACS® is an Acrylic Solid Surface that is easy to clean, as it is non-porous and resistant to tough stains and chemicals. HI-MACS® is specifically made for effortless fabrication and seamless installation making it possible for HI-MACS to cover surfaces of any shape and sizes. 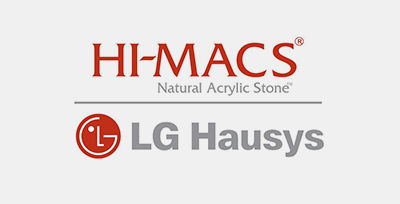 More importantly, HI-MACS® is soft to the touch and extremely durable. HI-MACS® has also developed an anti-bacterial product. It has all the intrinsic benefits of the original product plus built-in anti-bacterial protection, designed to optimize levels of hygiene in healthcare environment. With the widest spectrum of color and pattern choices, HI-MACS® can give you the perfect surface shade to complement your home or office the way you want it to be it warm, soft, cool or hard. HI-MACS enhances the elegance and harmony of your living environment with natural beauty and synthesis of design and creativity.